The Chevy Spark is about to get electric and move to Europe. It’s entry price is sure to make it a winner. Who says electric cars are either only here or in Europe but not both? Certainly not the Chevy Spark EV, the company’s first real electric car. The Chevy Spark electric car is already available in gasoline version and is awaiting the soon to be released fully electric EV. The Spark EV electric will be available in Europe when it goes on sale there in early 2014. It will be officially unveiled at the Geneva Motor Show next month. Technically Speaking. 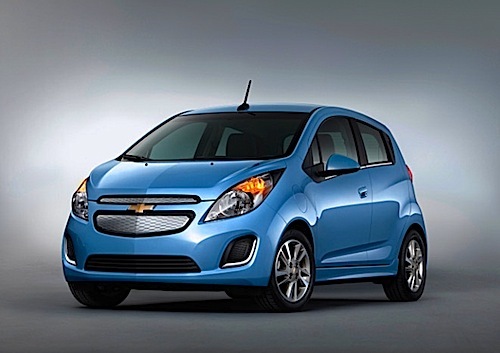 GM wanted to make sure if seriously designed and engineered the electric version of the Spark. The front wheels will drive the car with a 100 kW (130 horsepower) electric motor, developing no less than an incredible 400 pounds-feet of torque. It will have an estimated 0 to 60 mph time in about 8.5 seconds, which is still very honorable for such a small electric car. In case you’re wondering it beats the Nissan Leaf by ever so much. More Electric Than Electric. If the Volt is more than a plug-in hybrid (PHEV) and GM felt insisting it was more an electric car than anything else, it called the Extended Rage Electric Vehicle (EREV) then the new Spark EV is more electric then the extended electric drive Volt. Priced at about $32,500, it’s obvious GM and Chevy want to come into the market with a second generation electric car able to compete with the Nissan Leafs, Mitsubishi i MiEV and Ford Focus, to name a few out there. It also wants to compete on price, which is not bad after adding up federal incentives and state, we get a $25,000 electric car at the end of the day. It shows GM is serious about coming into the market with a decently priced electric car. GM is now making good on its first real electric car since the infamous EV-1 and the movie that made it to so successful; Who Killed The Electric Car. In the meantime, the market is ready for a second generation electric car that comes in at the right price and will face smaller car for a little more room.